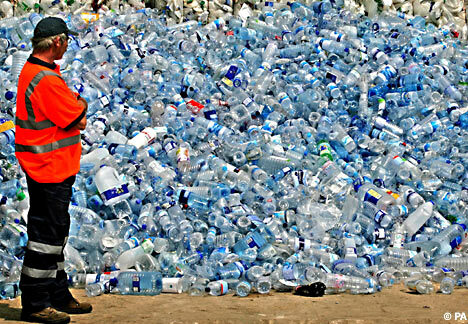 In the USA, a liter of bottled water costs pretty much the same, or even less than a liter of gasoline (petrol). What is wrong with this picture? Sure, we may have a right to sell tap water at higher cost per liter than the cost of gas – as long as there are enough people willing to pay those prices. We go to war(s) to protect our “right” to get cheap gas. Thanks for sharing, Mohan garu ! Another point to be noted is the the government spends some money, of not a lot, on processing the water before it gets into the water supply. And we all pay for this processing the the form of taxes. So if we are getting bottled water it’s like a double whammy. But one other issue it the water supply infrastructure. The supply pipes are so very old. Most of them, especially in old cities, have bad scaling inside. These pipes are made of cast iron and sometimes the iron leeches into the water supply. I have a first-hand experience of getting brown colored water at times in my apt. So I started using a filter ever since and I try to carry a bottle with filtered water whenever I go out. Relaying or fixing these pipes is an impossibly huge task. So I wonder how it would be addressed when it might become a more ubiquitous issue. I should have qualified the post title. Not every municipal water can be drank out of tap. Washington DC (city) is where I don’t out of tap. DC pipe infrastructure has a lot of lead in it. Another thing is – if your tap water is lead free (your municipality can tell you), do not drink out of hot water tap. Especially if that hot water is out of your basement hot water heater. It will have a lot of deposits. Lead pipes were banned more than 20 years ago (when I first came to US).